Real Food Fermentation Giveaway - 2 Winners! Home » Real Food Fermentation Giveaway – 2 Winners! 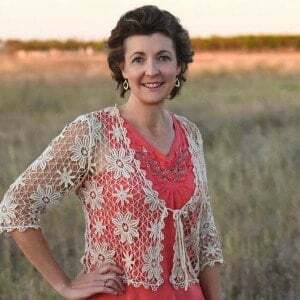 Real Food Fermentation Giveaway – 2 Winners! The following giveaway contains links to products from my affiliate partners that I personally use and recommend. The first of my weekly giveaways here at Cultured Palate, is a special one! 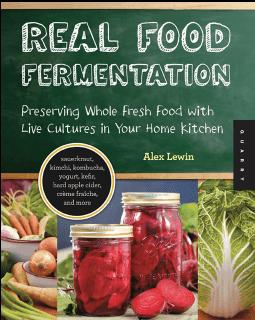 I am part of a blog tour and the prize to 2 lucky readers will be a copy of Real Food Fermentation by Alex Lewin. Plus I have a recipe excerpt for Kimchi from the book just to wet your appetite! Whether you are new to food fermentation or an old pro, Real Food Fermentation is for you. This 176 page book is filled with information from the basics of food fermentation to recipes with beautiful color pictures. For me it is very inspiring to have wonderful pictures and this book will not disappoint! Not only will you be able to follow proven recipes, but you will also be armed with the information necessary to express your creative side and make something unique and wholesome. … Because I began our REAL food journey when several of our children were [older children], they [were] a bit more resistant to changes. Their taste buds have been conditioned and corrupted by the sweet processed food “treats” that I once served more liberally. Talking with your children and explaining why you are making the dietary changes is important to do. Explain that you were wrong in the way you have fed them in the past. Use this opportunity to teach your children that the processed foods are inferior and that you want them to have the best nutrition possible – to be the best and healthiest they can be. They need to understand why fermented foods are so good for you and your health. But really? It’s all about health. And if you’re eating healthy food that’s also delicious, you’ll eat more healthy foods. Alex who blogs at Feed Me Like You Mean It, is not new to the real food scene. In fact, he graduated from Cambridge School of Culinary Arts and the Institute for Integrative Nutrition. He teaches fermentation classes and serves on the board of the Boston Public Market Association where he works to create a year-round indoor market selling local food. Boy, I sure would like one of those in our area! If you are looking for organic non-irradiated herbs & spices Click Here. In mixing bowl, dissolve the salt in the water to make a brine. Cut up any or all of the 2 pounds of vegetables. Put cut vegetables into the brine and mix, using clean hands. Cover the bowl … after 6 hours or so (or overnight) drain vegetables thoroughly in a colander. Taste them. They should be salty, but not unpleasantly so. Peel the garlic and onions. Peel the ginger. Blend the onions, garlic, and ginger in a food processor adding enough water to allow them to blend. Add the red pepper, sugar, and fish sauce, if using to the combination from step 5, adding just enough water to keep things blending into a paste. Cut the scallions diagonally into 1 inch lengths, add them to the paste, and mix the paste with a wooden spoon. Move the drained vegetables into a large bowl and mix them with the seasoning paste using the spoon. Taste the kimchi, if it is not salty enough, add more salt now and stir. 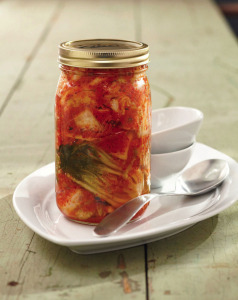 Pack the kimchi tightly into the Mason jars, leaving 1 inch of space at the top. Try to pack it down well enough to squeeze out most of the air bubbles along the side of the jar. Close the jar. Leave the jar on the counter at room temperature for a few days. Taste it every day or two. It should start to taste a bit “wild”. When you like the way it tastes, put it in a cellar or a refrigerator to store, or bury it in the ground. The cooler the temperature, the slower the subsequent fermentation. and leave a comment letting me know if you are new to fermentation or an ol’ pro! 2. Use the Rafflecopter widget below to enter. You gain extra entries when you sign up for my newsletter*, subscribe via email*, follow me on Pinterest, like my Facebook page and follow me on Twitter. If you are already subscribed to my newsletter and social media stuff – It still counts as an entry! Be sure you click the buttons in the Rafflecopter widget above. ***Remember to validate your email address or your entry will not be counted. Simple Cheesemaking Ebook is Here! I’m just getting started fermenting. I’ve really enjoyed your sauerkraut recipe and milk kefir. I’m ready to try more recipes. I am new to fermenting! I would really like to learn more about it though! i’m am totally new to fermenting and am trying to find out more about it. Very cool giveaway! I, for one, can’t wait to improve on my fermenting. Thanks! Entered over at Real Food Suomi and I want more chances to win, so I came over here. I hope I win a copy from one of you! 🙂 Thank you for the opportunity! Love your blog!! Thanks for the giveaway! I would love to own this book!! I love fermenting and would love to expand my knowledge!! Definitely new! I need directions! I am reading “Deep Nutrition” right now and really want to start trying more fermented foods so I would just LOVE to get started with this book! It looks amazing and very useful. Thanks for offering this great giveaway. Where do we go to see the winers? Thanks for your patience – we are in Georgia with family for Thanksgiving but the winners are now listed!